Participants may have different views on whether Obamacare plans are affordable. Until now, much of the debate swirling around Obamacare has focused on the cost of premiums in the state-based health insurance exchanges. But what will enrollees actually get for that monthly charge? States are starting to roll out details about the exchanges, providing a look at just how affordable coverage under the Affordable Care Act will be. Some potential participants may be surprised at the figures: $2,000 deductibles, $45 primary care visit co-pays, and $250 emergency room tabs. Those are just some of the charges enrollees will incur in a silver-level plan in California, which recently unveiled an overview of the benefits and charges associated with its exchange. That's on top of the $321 average monthly premium. "The hardest question is will it be a good deal and will consumers be able to afford it," said Marian Mulkey, director of the health reform initiative at the California Healthcare Foundation. "The jury is still out. It depends on their circumstances." A quick refresher on Obamacare: People who don't have affordable health insurance through their employers will be able to sign up for coverage through state-based exchanges. Enrollment is set to begin in October, with coverage taking effect in January. You must have some form of coverage next year, or you will face annual penalties of $95 or 1% of family income (whichever is greater) initially and more in subsequent years. The federal government will offer premium subsidies to those with incomes of up to four times the federal poverty level. This year, that's $45,960 for an individual or $94,200 for a family of four. There will be additional help to cover out-of-pocket expenses for those earning less than 250% of the poverty line: $28,725 for a single person and $58,875 for a family of four. The subsidies are tied to the cost of the state's silver level plans. 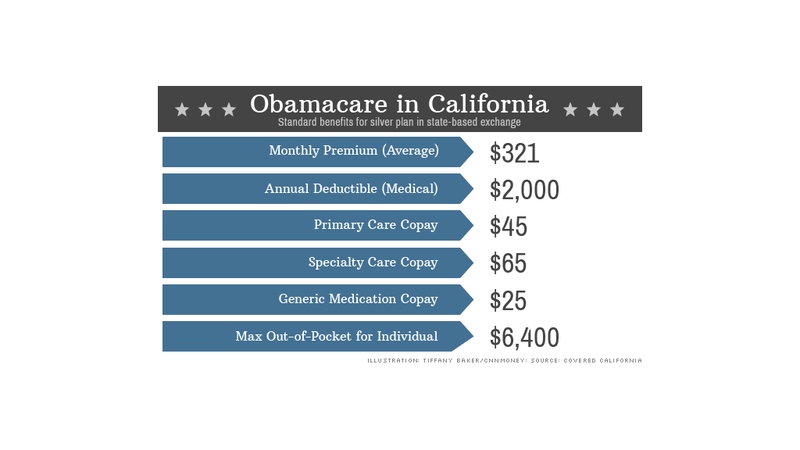 California offers insight into how much participants will actually have to pay under Obamacare. The state, unlike most others, is requiring insurers to offer a standard set of benefits and charges in each plan level. The only variables are monthly premiums, doctor networks and carriers in your area. For those in need of frequent medical care, the platinum or gold plans would reduce out-of-pocket costs for treatment. These plans have no deductible, and doctors' visits and medication are cheaper. But the trade-off is that they have higher monthly premiums. California has not yet released the premium range for these tiers. On the flip side, a young man who never visits the doctor and wants to minimize his monthly charge could opt for a bronze plan. A 40-year-old enrolling in this plan could pay as little as $219 a month. But, if he did get sick, he'd get socked with a $5,000 deductible, $60 co-pays for primary care visits and a $300 emergency room charge. Obamacare provides protection for those who need a lot of care by placing a cap on out-of-pocket expenses. The maximum a person in an individual platinum plan will spend a year is $4,000, while those in the other tiers will shell out no more than $6,400. "Insurance is expensive. It's hard for anyone who isn't well off to afford it," said Gary Claxton, director of the health care marketplace project at the Kaiser Family Foundation. "But it is good enough that you can afford to get sick without bankrupting yourself." Whether potential enrollees find these plans affordable will depend on how healthy they are and whether they are currently insured. Many individual insurance offerings currently available come with much higher deductibles, cover fewer expenses and limits on how much they'll pay out in a year. Plans on the exchange, on the other hand, are required to cover a variety of "essential benefits," including maternity care, mental health services and medication. "In many cases, depending on the plan, the coverage will be more comprehensive than what the enrollee currently has," said Anne Gonzalez, a spokeswoman with Covered California, which is running the state's exchange.